What if your Mum was different from everyone else’s? Amber and her family are struggling to cope with all the changes: A new home, a new school and new friends. And now Amber must make the decision of her life. Award-winning author Sally Murphy delivers a heart-warming story dealing with grief, tragedy, and change … But resilience, the importance of family and hope suddenly shines through in the darkness. 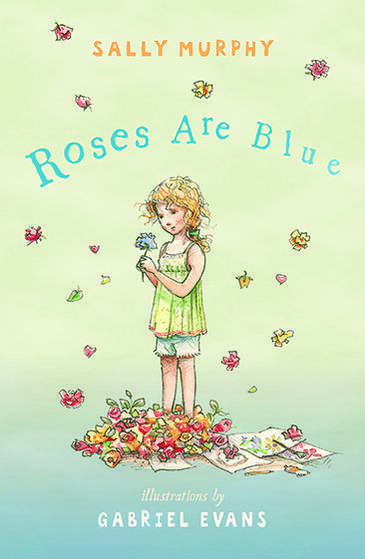 Roses are Blue delivers a powerfully written verse novel for primary school children, perfect for reading out aloud. Sensitively illustrated by newcomer Gabriel Evans in ink and charcoal to make Roses are Blue a graphic illustrated novel. 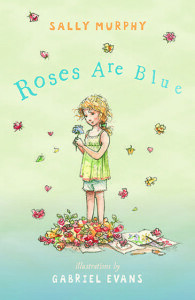 I highly recommend Roses Are Blue for children, families, teachers, librarians and school counselors. Thank you for the lovely review, Karen and for being part of the Roses are Blue blog tour. It like the way it’s written in verse. Being different is the theme of the story and that’s a nice way to compliment it. I’m guessing her mother has a brain injury and is unable to do the things she used to enjoy in her life and with her family. Resilience is key to recovery for so many things in life. Sounds like a wonderful book. Congratulations, Sally on what looks like a brave story and one that will offer an insight into loss and change. I am a fan of verse novels and would love to read this book and then share with my daughters. Thanks for hosting, Karen. Agree it is a great book. I have a few questions Sally has answered as well as a review planned for my blog on Friday. Please don’t enter me in the draw though Karen as I already have my lovely copy. It looks enchanting. I’d love to win a copy so I could donate it to my son’s school library. They don’t have a lot of books and I’ve been trying to help them out with that. I would like to win so I could give it to the girl I’m nannying for this summer, as I’ve spent the last month urging her into reading and now she’s devouring books at a young-me-ish rate! I don’t think I’ve ever read a verse novel, I’d better change that! I found it very difficult to find books like this for my kids. A teacher, another adult or reading it in a book tends to be believed more.. Not just mammy trying to make everything ok.
‘Perfect for reading out aloud’, this is exactly what is needed for my niece to keep the fun and enjoyment in reading so she doesn’t give up. She’s come so far. My daughter’s just started school and an avid reader and I know she’d love to read this to her baby brother! It’s my toddler’s b’day in Sept and this would be a lovely present! I think anything that encourages children to read is important, and this story has other lessons as well, helping our children to understand that things change and not everyone is the same, some have different skin colour, customs, languages or disabilities. Thanks everyone for dropping by and commenting. Good luck with the competition draw! I love reading stories like this to my son, and this book looks beautiful. I guess just like all parents I would love for him to grow up to be a compassionate, caring person and I try to find ways everyday for him to see that. Through words, actions and books of course! As a recently retired librarian I Recognize the need for a book on this subject that is written for this age level. As a grandmother, I think that this would be a wonderful way to introduce my granddaughter to this subject matter. Thank you for this giveaway.